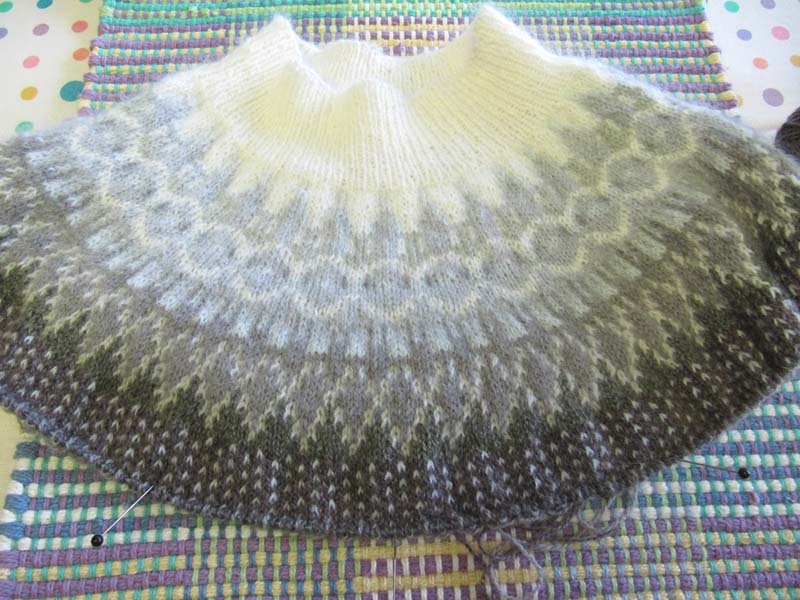 There hasn't been a lot of knitting to write about lately as I've been making negative progress on my Bohus. I wasn't happy with the look of it for a number of reasons, so I carefully ripped back all the way to the neck ribbing and started again. My main objection was to the purl stitches, or more acurately, my purl stitches. When I originally looked at the sweaters online, I didn't realize that there were any purl stitches and I admired the smooth appearance. I was suprised to see them when my kit arrived and I started to read the pattern. So, I made them. I wasn't happy with the results when it got to rows 46 to 58. When you introduce a new color by purling on the right side, you get a two-color bump. Now, a friend (Ravelry link) of mine did this part and made it look marvellous. I'm thinking that perhaps my purls were looser than my knit stitches, but whatever the reason, mine just ended up looking bad. That's when I made the decision to do no purls, on this sweater at least. I'm sure that I'll knit another Bohus in the future and I made add them in then. The result is a nice, smooth, laying-flat, bit of knitting that I'm happy with. You may think that you're seeing a bit of ripple in the bottom part of the knitting in the picture, above, but really it's because I've got 388 stitches scrunched onto the circular needle. I'm about to increase to 400 stitches...all this on size 2.5mm/US #1 needles! I know that the way I'm knitting strays away from a traditional Bohus, but it wasn't going to be authentic anyway. I'm using the original yarns, purchased here, but I'm not Swedish, from Bohuslän, and I plan to work the body in the round. The originals are constructed in pieces. I'm thinking ahead and would like to make another one of these sweaters, wandering even further from the original, but still using the original patterning. 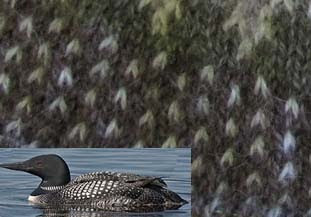 I wonder how it would look if I use Shetland wool? I may have to give it try, and I might have enough yarn in my stash to accomplish this. Using my stash is a major goal for me for a while, until I get it under control a bit. Some patterns can be found in the excellent Poems of Color book by Wendy Keele. But that's for another time. For now, I'll soon be working on miles of black knitting with tiny yarn and tiny needles...and I'm looking forward to it. This is the kind of knitting that I like. By the way, there are a group of us who meet once a month to work on our sweaters. If you're in the Denver area and you're knitting a Bohus, why not join us? We meet at the Southglenn Library in the Streets of Southglenn shopping district, Centennial, on the first Monday of the month, starting around 5pm. If you're here on vacation and can only come to one get-together, you'll find yourself welcomed. There's no charge for this. We just meet and knit and chat. Email me if you have questions or if you'd like to be added to the notification/reminder email list.